Facebook Desktop – We’re international, baby! Some of you might remember a side-project of mine that I announced here which I called Facebook Desktop. In short, it was a small application that I initially wrote for myself to help me stay in touch with my friends and family through Facebook. It would sit in my system tray or dock and quietly push messenger-style toast notifications to my screen whenever something happened in my Facebook stream. Neat, huh? I thought so. So, I built it out and eventually released it as a free app for everyone to use! Since then, it’s actually picked up quite a bit of steam and now enjoys thousands of users from all over the world! I’ve had a couple of releases since I first announced it, but this latest release is special and so I wanted to mention it here. The popularity of the app, especially overseas, took me by surprise. Considering this started out as a small utility I built for myself over a weekend, I didn’t anticipate it being used overseas. But now, it’s actually used in over 20 countries all around the globe! In fact, the bulk of our users are overseas! After noticing this, I made the decision to devote the entire next release into adding language support for all of our international users. Technically, localizing the application wasn’t a problem (I’ve had some experience in the area). The bigger problem was actually getting all of the text I use in the app translated to all of the various languages I wanted to support. Then, someone posted a beautiful message on our Facebook application page. Shortly after, a comment: “Me too, for Italian!”. And another: “I can do Hindi”. That’s when it hit me…crowdsourcing! I’ve never done it before, and there are plenty of ways that it can blow up in my face, but it was obvious to me that our users wanted it, but more importantly, were willing to help make it happen! So, I took advantage of it! The next day, I posted a message to our page asking if there is anyone willing to help translate Facebook Desktop in their native language. The response was amazing! At the end of the day, we had over 30 responses with people volunteering to translate in over a dozen languages! I couldn’t ignore this, and so I took everyone up on their offer and started getting all of the text translated. A couple of months later, a bit of coding, and a lot testing, it’s released! 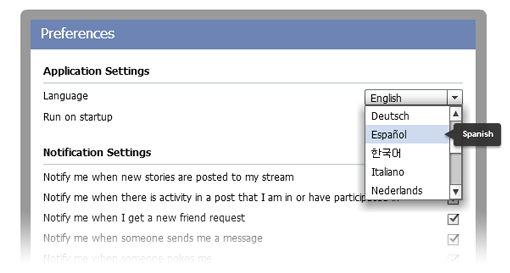 Facebook Desktop v0.84 went live last night at midnight with support for a whopping SIXTEEN languages. This version of Facebook Desktop could not have been accomplished without the help of the community. Plain and simple. On top of that, engaging with the users in this way made this release that much more fun too! In the future, I’ll definitely be looking to involve our users more. It’s better for them, it’s better for me, and it’s better for the app! To infinity, and beyond! Want to Localize Your Flex/AIR Apps? It’s Easy! I’ll Show You How…Again! For anyone who is interested in localizing their Flex or AIR applications, I’ve written a very simple series that I’ve contributed to the Adobe Developer Connection. As I’ve mentioned before, localization may seem like an enormous task, for any application, but the Flex framework provides great utilities to make this process surprisingly easy! The articles are part of a two-part series which focuses solely on the task of localizing Flex and AIR applications using the Flex framework. I’ve previously talked about Part 1, but now Part 2 is published and the series is complete! Here is the end-product of the tutorial, which you can emulate for yourself in your own applications! The series covers a variety of ways to attack the task of localization. Different approaches have different advantages as well as disadvantages, but with the complete series, you will hopefully have a better understanding of what approach will suit your needs and your customer’s needs. Until next time, happy localizing! Want to Localize Your Flex/AIR Apps? It’s Easy! I’ll Show You How! If you have an application or a website, and you’re targeting (or want to be targeting) an international audience, then you’re going to have to localize! What that means is preparing your application for international use by building support for multiple languages. It may sound like a daunting task, but the Flex framework makes it surprisingly easy. I’ve written a very simple tutorial on the Adobe Developer Connection Flex Community that walks through a straightforward way of localizing a basic Flex application. Here is the end-product of the tutorial, which you can easily create yourself, or implement within your own existing project! Charles Bihis is a Computer Scientist for Adobe Systems. The views expressed in this blog are his own and do not necessarily reflect those of his employers. abubakar ibrahim on Facebook Desktop! Open-Sourced!